OJOS nuevos is not an isolated project, but shares the similar vision of a larger movement of social photography projects aiming to provide increased opportunity to marginalized or frequently overlooked members of society. I believe developing and supporting these programs is important not only for the real benefits of the students involved – be they children, teenagers, or adults – but also for our global society, for photography and art, for the inclusion of stories and perspectives in the broader scope of culture and history that might otherwise not have been given space. In addition to the personal growth of the participants of these programs– stronger self esteem, confidence in self-expression, a deeper understanding of their community and a new perspective on their society– educational opportunities or scholarship may also become available further increasing the common goal of breaking the cycle of poverty and helping to enable these participants to change the course of their lives. In 1991 photographer Nancy McGirr founded FotoKids as Out of the Dump having started the program with six kids living and working in Guatamala City’s garbage dump. Now, some 16 years later, the program reaches out into six different communities and has added many other classes to the original documentary photography workshops. Supporting the participants with educational scholarships helps the children have access to a better future. Visit the site. 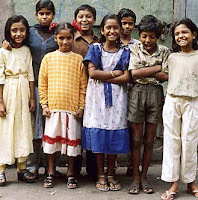 Kids with Cameras, a project initiated first in Calcutta’s red light district by photographer Zana Briski in the year 2000, might currently be the most well-known program of its kind due to the moving documentary Born into Brothels. A New York based photographer spending months at a time living among the prostitutes in this district, Zana befriended some children who lived there as well and began to teach them photography. 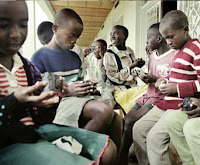 An incredibly successful project on many levels, including a safe home and educational opportunities, Kids with Cameras continues to improve the lives of children now in multiple countries. Visit the site. In the year 2001 photographer David Jiranek, inspired by Imbabazi Orphanage founder Rosamond Carr, began workshops in Rwanda with the orphans of the 1994 genocide. The children photographed for themselves, to learn about their country and to document its rebuilding. Now the project, Through the Eyes of Children, has grown, exhibitions are touring and all proceeds benefit the education of the children involved. Visit the site. BRIDGES to Understanding, The Home Alone Project. Please share any other similar programs you may know about. I am interested in how photography and visual representation can challenge social and political inequalities, particularly in the Americas. A recent graduate from NYU's Master's program in Latin American and Caribbean Studies, I focused on social practices of vernacular photography in Peru as well as the Quechua language. 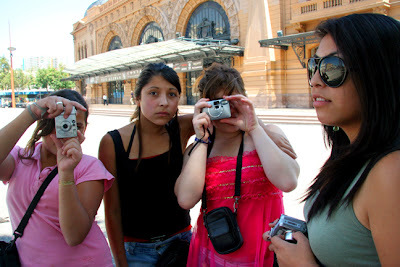 In 2006-07, I worked with VEGlobal, an organization in Santiago de Chile of volunteers that develops educational programs for Chilean youth living in shelters. 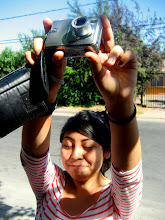 Along with volunteer Lindy Drew, I developed OJOSnuevos (newEYES), a digital photography program for teenage women. This blog serves as a place of informal reflections on issues of representation, and a place where I can discuss works in progress.